Karen House : Dec. 6, 2018, 1:08 p.m.
A fire destroyed a home on Flat Mtn. Road Wednesday evening. Photo contributed. 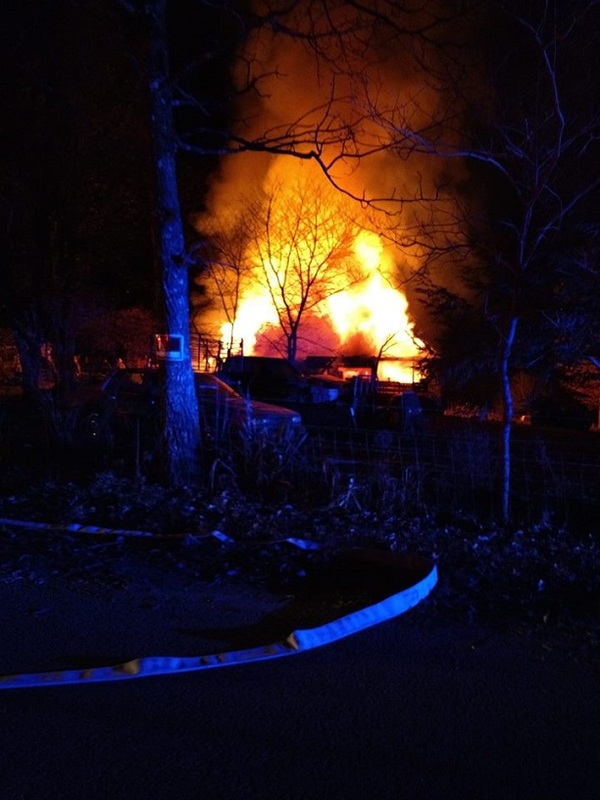 Dec. 6, 2018 – A family on Fredonia Mountain lost their home in a fire Wednesday night, Dec. 5, but no one was seriously injured. The family was inside the home at 927 Flat Mtn. Rd. when the fire started. Fredonia Volunteer Fire Department got the call at 6:50 p.m., and were assisted by Cagle and Dunlap fire departments. The scene of the fire was cleared by 9:30 p.m., Ruehling said. Firefighters contained the blaze to the one structure, but it was a total loss. Neighbors are accepting donations for the family of linens, furniture, food, and gift cards (no cash). Clothing needs include sweat pants, socks, undergarments. Girl, 14 years, size 5 pants, size 7 shoes, medium tops. Woman, 55, size 12-14 pants, size 8-wide shoes, large tops. Man, 65, size 32x30 pants, size 9 shoes, large shirt. Man, 24, size 30x30 or 30x32 pants, size 9.5 shoes, medium shirt. Donations may be made out to Dunlap United Methodist Church (tax deductible). Or call Melissa Mackey for more information, at 423-447-8275.